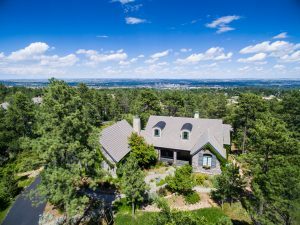 Colorado Springs is blessed with many foothills communities, tucked within the Front Range and offering spectacular views of the city. The higher they are positioned in the foothills, the more exclusive the community. 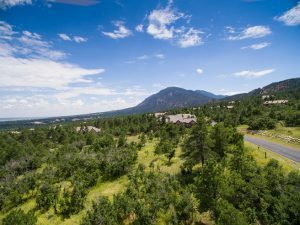 Stratton Pines is a shining illustration of an exclusive foothills neighborhood, just north of Cheyenne Mountain and west of downtown Colorado Springs. It is a luxury living, gated community of 19 home sites with remarkable custom homes. Spend time in Stratton Pines and you will experience the beautiful sights and soothing sounds of Luxury living. It begins with cul-de-sac streets and natural surroundings in every direction, including pine forests and areas of scrub oak, the mountains and expansive blue sky. Enjoy the sounds of nature; birds chirping and the rustling wind in the pines, the calming silence that is occasionally interrupted by neighbors greeting one another, and the bells of Will Rogers Shrine. Luxury living in Stratton Pines has a refreshing aroma to it, with the scent of pine trees, fresh air and the foliage warmed by the sun. This community offers all the elements desired when building your dream home. With only four lots remaining, the clock is ticking. Choose the home site meant for you and Comito Building and Design will take it from there, providing exceptional quality and service since 1983. Comito homes are distinctive and built with extraordinary attention to detail, to fit your personality through their collaborative design-build approach that creates high performance and energy efficient luxury homes in Colorado Sprigns. Comito Building and Design will make your dream home their top priority as you work with them during the design process. Their success at building award-winning homes has been recognized with 28 MAME Awards, the industry’s awards for product excellence, including Best Architectural Design, Best Interior Design, Best New Home, Best Landscaping and the Grand Award Winner- the industry’s top honor. Although private and secluded, this community is located near downtown Colorado Springs with its wide variety of restaurants, shopping and entertainment, just minutes from the historic Broadmoor Hotel, and numerous hiking trails in Cheyenne Canon, Bear Creek Canyon Park, and the Pikes Peak National Forest. It is bordered by the similarly exclusive communities of Stratton Forest, Stratton Preserve and The Village at Stratton Preserve. Choose Stratton Pines as your luxury living community to call HOME. Schedule a personal community tour today by calling Camellia Coray at 719-359-0014.